Part 51 is directed at the pitcher who has a pit or stake in the backyard and is constantly trying new ideas to improve their ringer average. This part is not a series of quick fix tips. It will take time and dedication to reap the rewards of some of what follows. There is nothing magical here, just a series of common sense techniques supported by a variety of helping aids. This part actually began in 2007 when I first began to question methods to improve my pitching technique. Actually, I had no pitching technique. It was all new and I needed to start from scratch. As with many new pitchers, I thought there was a recommended location for pulling a string or cord at some height to throw over. I found one reference that said that the highest point was 60% downrange from my release location and 2 feet above my personal height. So, for 37 feet, a little over 23 feet from the foul line and just under 8 feet high. The 60% proved to be incorrect. 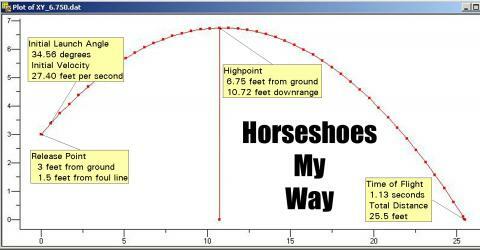 The Physics Forum provided me with a formula to be used to calculate the high point location when the release point height and location was known. This introduced a new problem. How do you actually know where you release the horseshoe. A simple electronic circuit consisting of a battery and LED attached to my pitching glove gave me the answer, 3 feet from the ground and 1.5 feet in front of the foul line. The banner at the top of each part, including this one, shows the actual plot. I ultimately had to prove the results with a slow motion video, now on Youtube. It further proved that I needed to make sure that what I said, was provable. Knowing where the highpoint is, provides no meaningful information, since you don’t have a way to know whether the horseshoe is going up, leveling out, or going down. So, it became a useless target. Actually, the highpoint of the center of gravity of a horseshoe never reaches the halfway point for 30 or 40 foot flights. It turns out that there are easier ways to monitor the more important issue of “Drop Angle”. I will start there. Below is a compilation of a series of simple Practice Tips that I hope will help you get started in horseshoe pitching, try something new, or help to fix something you’ve been having problems with. I continue to use every tip or technique I mention here and all have been developed after lots of trial and error. I encourage you to develop your own tips to develop the muscle memory needed to be successful. Keep in mind that incorporating some of these suggestions will alter your horseshoe arrival, so, factor that in as you practice. I am including a number of images and photos previously used, but, included here to keep you from searching through the previous parts for examples. I often suggest to new pitchers that they visit a NHPA tournament and witness the styles and techniques used by the Class A or B pitchers in their area of interest or class. It would not make much sense for a new Elder class pitcher to try to emulate a 40 foot pitcher using a 1-3/4 turn. It is also important to be aware that many of the pitchers are using unique techniques developed from a young age and now incorporated into their muscle memory. The tips described are simple and easy to use. I start with what I consider as the Best Tip overall, whether practicing as a flip or turn pitcher…Keep A Journal. Best Tip — Keep A Journal. It is important to keep a record of your practice sessions. A little spiral bound notebook will do the trick. Each page should be titled and dated for the subject of your practice session. I created a form that I used to give me the record I needed to evaluate the results of my practice sessions. 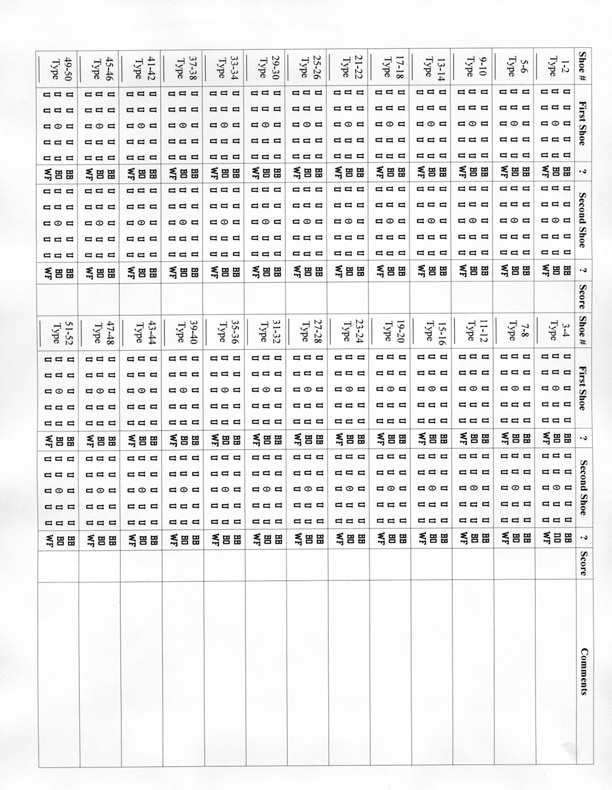 Below is a copy of the form. I would circle the appropriate “U” for arrival information relative to the arrival of the shoe at the stake. “BO” = bounce offs; “BB” = bounce backs; and, “WF” = wrong form. To print this JPG form, double click the form and print whatever number of copies you wish. It was the keeping of this journal and recording results that showed my tendency to miss left, hardly ever right. As my ringer average improved, I noted an increasing number of bounce backs, a perfectly thrown ringer that hit the stake and bounced straight back. I was able to correct the horseshoe arriving left by correcting my unruly left shoulder rotation. I was able to correct the number of bounce backs by switching to a 1-1/2 flip. 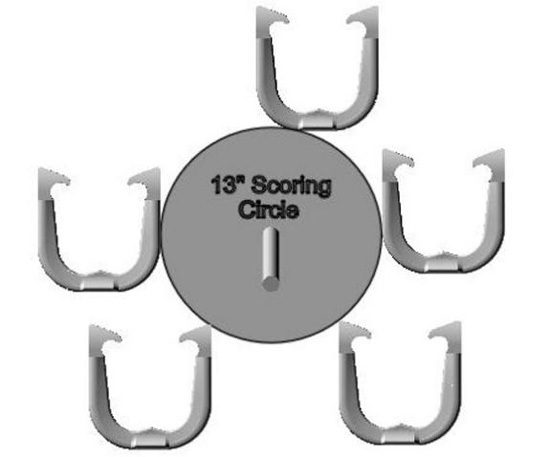 There is only one goal in horseshoe pitching…score 3 points for each ringer, and if not a ringer, then 1 point with each horseshoe not a ringer. You would think this fact is self evident, however, it seems that this is not the case. If you pitch in sand from time to time and watch your misses hit and slide to the backboard, Tip 1 is for you, whether pitching in sand OR clay. The first few examples will help you gain a few of those single points while improving your ringer average. It is difficult to say one tip is more important than another, but, if you are a flip pitcher, then Tip 1 will prove to be the most valuable. It will prove to be the most valuable for accumulating single points if not a ringer, softer shoe arrival, staying within point range, requiring less effort to cover the distance and doing less damage to your horseshoes. If you are a turn pitcher and throw your horseshoe low and hard, check out Tip 1. The simplest way to improve your Drop Angle is to surround the stake with a 15″ used rubber tire (see image below). If not a rubber tire, then a length of 4×4 across the pit about 6″ in front of the stake. 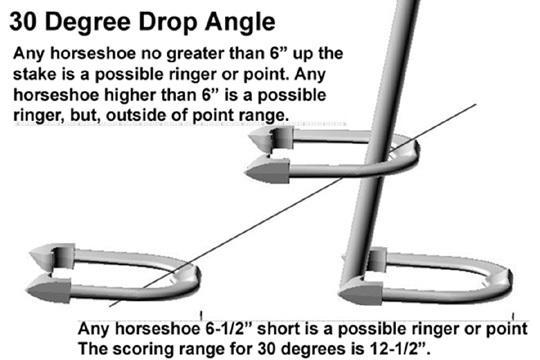 Calculations indicate that a horseshoe arriving at a Drop Angle of between 30 Degrees to 45 Degrees (see images below) will tend to stay within the 13″ scoring circle (see image below). 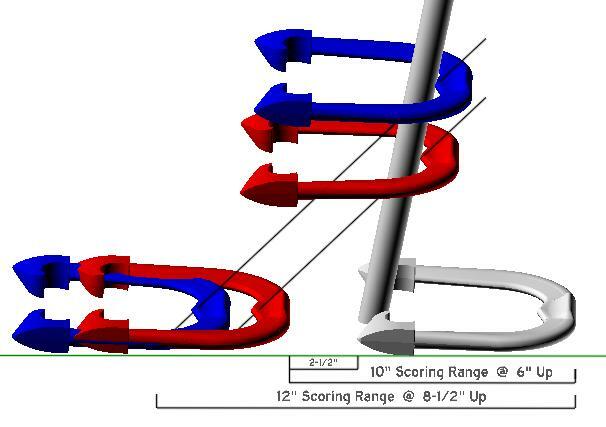 Your goal is to drop the horseshoe onto the stake without hitting the sidewall or the 4×4 when arriving. The shoe will then arrive softer, which reduces rejection, and allows you to pitch the horseshoe with less effort the required distance. Remember, the higher you pitch the horseshoe, with the same initial velocity (speed), the greater the distance traveled (up to 45 degrees). Using Tip 1 will not only help with your Drop Angle, but, direction and distance. The image above displays the arrival of a horseshoe at 30 degrees. The image above displays the arrival of a horseshoe at 45 degrees. 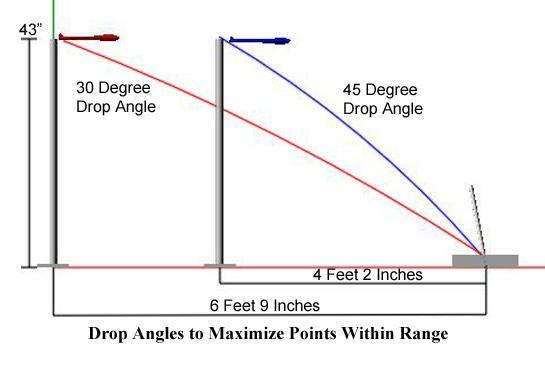 Note that the greater drop angle gives you more potential for staying within the 13″ scoring circle and allows you to arrive at the stake a bit higher up. The image above represents the use of a 15″ used tire for improving your arrival at the stake. The tire above left, shows a cutout that allows me to see the bottom of the stake from the approach. Removing the bottom sidewall makes the removal of the cutout easier. Your goal here is to throw the horseshoe high enough to clear the sidewall at arrival, and land within your scoring circle. This simple aid will immediately improve your “Drop Angle” arrival. The 43″ tamper that I use to prepare my clay pit works great to position a target over my Line of Flight at a distance from the stake to improve my “Drop Angle.” This is a more effective way to provide a target over the previously mentioned string above. The NHPA uses 6″ for measurement of a single point. The image above represents the scoring circle available to capture those single points in “Count All” or cancellation matches. What does it mean to “stand tall”? It means that when you step to the approach and take your stance, you stand relaxed and upright and without a bend at the waist. The head is the heaviest part of the body. When you bend at the waist as you start your stride forward, your weight automatically shifts ahead of your feet. This causes your stride to be longer to catch up and support the balance of this weight shift. It lowers the hub of your swing and causes the horseshoe to arrive lower and harder to cover the same distance. This bend at the waist is not a natural method of walking. We don’t lean over, and step out to catch our balance. We normally keep our head relatively level as we stride forward and take a nice comfortable, balanced step forward. It is better to do what we normally do when we walk and incorporate that into your stride forward. Under normal circumstances the stride forward provides the forward impetus to carry the horseshoe to the stake. With a “stand tall” delivery, your natural stride can be shortened which will allow you to stand a little closer to the foul line. With this setup, stride and delivery, your shoulder will follow a straighter line to the stake and automatically allow your release to be higher above the ground and with the shoe automatically arriving from a higher drop angle. Strike A Pose is a great practice method to insure that you end up with the proper stance that is married to your release method. What you are trying to do is make sure that you finish your stride in a stable and balanced position. The best way to do that is to release the horseshoe and finish standing on your striding foot with your trailing foot off of the platform. Check out some of the photos on the NHPA website of some of our greatest pitchers and note that they finish their release by balancing themselves on their striding foot, trailing leg off the approach and releasing arm in a “handshake with the stake.” Including this “Strike A Pose” position during your practice will identify any tendency to lose your balance. There is no way to be accurate in your delivery if you end up losing your balance at some point during your delivery. It is essential that you are accurate with your footwork. Setting your feet at address and locating your finishing stride location exactly, the same on every pitch, eliminates one more reason for a miss. The easiest way to monitor your footwork is to use a wet towel and place it just behind the approach. Make sure both feet step on the towel before placing your feet on the approach. As you step into your setup footwork and follow with your stride forward, you will be leaving your footwork on the approach. After a few pitches, your footwork outline will be visible on the approach. If a shoe goes left or right of the stake, you can check your striding foot plant and the ending location of the trailing foot to see if you planted your feet differently or accurately. Our normal style of walking or stepping forward is to rotate your upper body in the direction of the step or stride. If you are right handed and stride forward, your right shoulder naturally rotates toward your left foot. The opposite for the right foot step/stride forward. This normal tendency to rotate the upper body leftward will rotate your swinging arm to the left. The majority of the pitchers I observe will miss left of the stake. The other reason, which we’ll cover later, is swinging offline. There are two ways to learn to control the left shoulder. First, place your left hand across your body and lock your index finger (if possible) into the belt loop to the right of your pants zipper. This will feel odd at first, but, will give you the feel for keeping the shoulder from rotating. If you feel the tug on your index finger during the left foot stride forward or backswing, you’ll know that your shoulders are attempting to rotate. In actual play and practice, you can monitor your left shoulder by setting up on the approach with your shoulder within your peripheral vision and your left hand is resting on the inside of your left thigh. Don’t allow your left hand to move away from your left thigh throughout your address, backswing and stride. If you miss left after stopping your shoulder rotation, then in all likelihood you are swinging offline, most likely during your backswing. Fix that with Tip 6. A very common problem that causes horseshoes to go left is swinging offline during the backswing. It makes more sense to keep your shoulder and arm going straight up, down, back and forward straight down the Line of Flight. 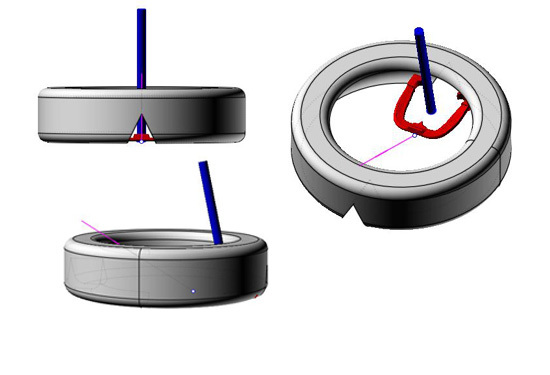 That is a simple line drawn from the center of gravity of the horseshoe from the address position, is followed accurately from setup, address and delivery. There is absolutely nothing gained by bringing the horseshoe up to your eyes for sighting to the stake. That move immediately takes your horseshoe and arm off line. To be placed correctly back on line you must make a simulated figure 8 move to put your horseshoe, shoulder and arm back on line. Why do it? 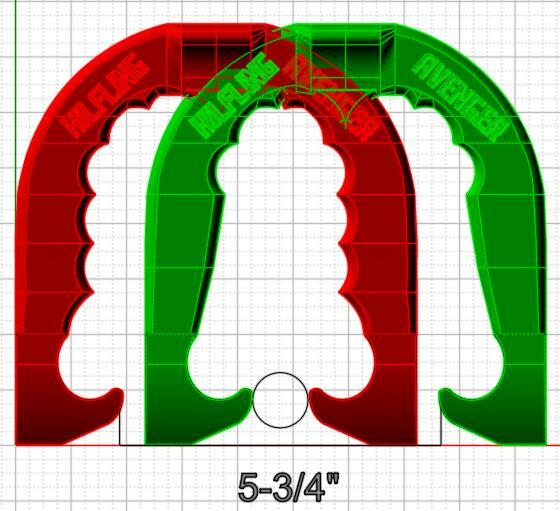 Secondly, if you raise the horseshoe up to your address position and align it with the stake, you are off line. A very simple test to prove your off line position by using the stake for alignment. Ask someone to stand behind you and have you swing up and align to the stake. I will guarantee you that your address arm is aligned well left of the stake (if, right eye dominant and swinging with the right arm). Next, tell your spotter to adjust your arm and horseshoe to the right until he sees your arm and horseshoe aligned with the stake. You will probably see your horseshoe pointing 14 inches or more, to the right of the stake. I will also guarantee you that your horseshoe at this rightward alignment is directly over the Line of Flight. When your spotter tells you that your horseshoe is pointing at the stake, just look at where the horseshoe is aligned when looking down the left shank of the horseshoe and use that location as your “Visual Alignment Point”. For me personally, it is generally the right corner of the backboard. So, how do you use this knowledge (Visual Alignment Point) to keep the horseshoe going down the “Line of Flight”. First, begin your setup by resting your horseshoe on your right leg with a fully extended arm. Next, swing up to your address position at your personal Visual Alignment Point (to the right of the stake). When you swing back, try to brush the horseshoe against your right pant leg. This insures that at this point, your swing is still on the Line of Flight (back where you started). If you don’t brush your pant leg, you will be swinging off line, and more than likely your horseshoe will go to the left of the stake at delivery. Naturally, this applies when you have not yet moved forward before the leg brush. Tip 6 describes the steps to keep your horseshoe going straight, from setup to the stake following the straight Line of Flight with the center of the horseshoe going straight at the stake. If you miss left and right of the stake, you’ll need to work out some method to at least eliminate one side or the other. Resting the horseshoe against your pant leg and brushing it on the return swing will at least help, with ruling out one side or the other. The photo below shows the Line of Flight (the cord on the approach); the Center of Gravity of the horseshoe directly over the Line of Flight (the plumb from horseshoe to Line of Flight); the horseshoe resting on my right leg with fully extended arm. The actual width of the opening of a horseshoe is restricted by the NHPA to 3-1/2″ when the opening is measured at a point 3/4″ from the tips of the hooks. They permit an additional 1/8″ for used horseshoes. However, there is an “effective width”. That is the width that you should consider for pitching purposes. Using the 3-1/2″ above provides an effective width of 5-3/4″. How is that possible? The photo below describes the “effective width”. The importance of using “effective width” is to give you a little fudge factor or correct an arrival problem. 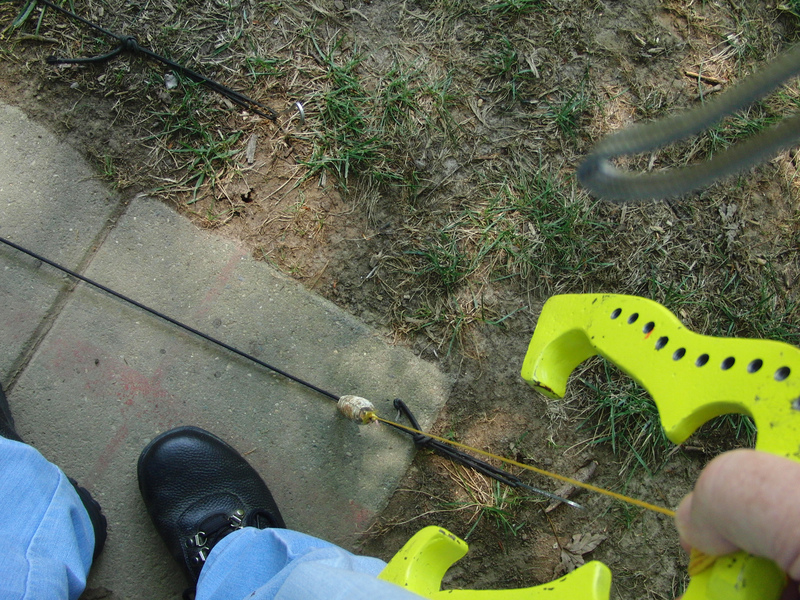 If your horseshoe is arriving a little to the left or right, use the “effective width” to pick your target a little left or right of normal to pick up a few more ringers. So, if you’re coming in a little left, move your target to the right a little. If you’re coming in a little right, move your target a little left. Normally, you try to throw the Center of Gravity of the horseshoe at the stake, but, in this case, use your fudge factor. There are instances where a horseshoe will block your way to the stake. This could be your first shoe or one of your competitors horseshoes. The goal is to hit higher on the stake. There are at least 4 easy ways to clear the propped horseshoe. Remember that the highpoint of flight to the stake is a function of the distance to the stake and release point from the ground. Using your normal swing speed and using one of the techniques below, will cause the horseshoe to arrive higher on the stake. You’ll need to experiment with which of the techniques works best for you. 1. Using your normal arm swing speed, release the horseshoe a little later in the upswing. Again, there is no need to increase your arm swing speed. Using this technique will cause the shoe to go higher and carry farther, thus hitting higher on the stake. 2. Raise the hub of your swing. The hub of your swing is your shoulder. Raising the hub (shoulder) will cause the shoe to be released higher from the ground which increases height of the arc, and carries the shoe higher at arrival. Remember, the highpoint of flight is dictated by the distance from the stake and the height from the ground of the horseshoe when released. Raising your hub increases the release height from the ground. This requires you to raise your shoulder at setup and keep it raised through delivery. 3. Move a little closer to the foul line and use your normal release. In this case, you are releasing the horseshoe at the same location relative to the ground, but closer to the stake. Thus, your high point is closer to the stake. 4. When you take your stance on the approach, lean back a little and put more weight on your trailing foot. Without changing your release point relative to your normal swing, will allow the horseshoe to be released higher, thus carrying the horseshoe higher. This is different than number 1. above, since you’re not releasing later, just higher. Making note of the condition of any stake is important. If you are a flip pitcher and a stake hitter, (you know who you are), you’ll need to pay particular attention to the condition of any stake. When you arrive at the venue, take a look at the alignment of the stakes down through all of the pits and make sure they all have the proper lean. If you see one or more stakes that are not leaning properly, you may have to deal with a broken or loose stake. Keep it in mind. Making your target the bottom of the stake is a good idea under all circumstances, but, particularly in the case of a loose stake. Keeping your horseshoe in single point range is important. It is not unusual to find a stake a little loose, which will definitely affect your impact results. If pitching in clay, and before turning it, look at the base of the stake. All stakes will move backwards and rebound slightly during the course of a match. If you see a gap between the back of the stake and the clay of 1″ or more, check the stake. First, reach down and grab it in hand and see if it feels loose. Next, tap it with your horseshoe and see if has a “clunk” sound, instead of a normal “ring”. If it’s too loose, call it to the attention of the venue official. You may have to move to another court. If not really bad, just make allowances for the condition. A loose stake will tend to rebound stronger like a trampoline effect when hit, thus, throwing horseshoes back at you. Your best solution when dealing with a loose stake, is to concentrate on hitting the stake no higher than 6″ above the clay or sand surface. The mounting employed during installation is an important factor in the reaction of any stake when and where hit. There has always been a little controversy about marking the approach. If you can do it, do so. Carry along a tailor’s tape, the kind that can be rolled up and a little piece of chalk, colored if you like, to mark the approach. If you are unsure, check with the TD. Naturally, you’ll need to know your approach measurements before you arrive. Just be prudent when making your mark. Just a small line should suffice. In all of the tournaments I’ve pitched in, there has never been an objection to doing so. In my first Pro Tour event I saw this for the first time and there was no objection raised. It’s a good idea if you can do it. I don’t normally mark the approach as I know where to position my feet relative to the left edge and right corner of the approach. In one case, however, it was necessary when there was no approach marking and right corner was not indicated for 30 foot pitching. In this case, I used my horseshoe to mark the indicators. A swing cadence is a good way to direct your concentration on your pitching and deal with any distractions around the pits. Finding a smooth rhythm/cadence is important. I have tried the metronome, but, it is not something you can take along to a tournament. Normally, a cadence or rhythm is worthwhile if you use the rhythm to swing up, back and forward to release in continuous movement. It is more difficult if you normally start with a stationary address position. If you choose to use a cadence, then either use a count, i.e., 1 and 2 and 3, for “1 and” up, “2 and” back and “3 and” release. Or, you might want to use a song such as the “Skater’s Waltz” for the smooth mental rhythm it invokes. I have found during tournaments that there are many distractions behind the pits. It would be helpful if you concentrated visually on the base of the stake AND use a count mentally. That’s a good way to blot out all of the distractions. Setting my Visual Alignment Point above the activity sometimes works for me. You really need two ways to blot out distractions, one to take care of your mind and the other your eyes. Tip 12 — Using the non-dominant eye. During your next practice, try using your non-dominant eye for setup and alignment. Close your dominant eye and view the stake with your non-dominant eye. Without opening your dominant eye, try pitching at the stake. You should feel a strange feeling in your delivery. Did you hit the stake? Try again. Did your horseshoe go at the stake? Do this with your first 5 or 10 pitches. Next time, stop at your address position and open your dominant eye. You should see your address position is way to the left of the stake. How can you explain that your address position was way to the left of the stake and yet you hit it every time you released the horseshoe? You are basically re-routing your arm swing and forcing yourself to swing out to the right. You might want to use a different address position in the future. I will use this revelation to offer another option as a Method in the future. I am adding the following comments on the 16th of August. After you have tested the ability to hit the stake using the non-dominant eye, give the following a test. Now that you’ve tested the non-dominant eye, try the dominant eye. This time go through the same process as with the non-dominant eye, but, use the dominant eye only. Were you able to hit the stake using the dominant eye only repeatedly? Yes? So far, so good. Establishing and maintaining correct body alignment is the best way to insure your delivery and release is the same every time. Most pitchers are pretty good at placing their feet about the same each time, but, how about your upper body alignment? Are your shoulders oriented the same each time? If you miss the stake to the left or right without explanation, perhaps your shoulder alignment is not the same every time. Try this little tip when practicing. Buy yourself a nice shirt that has a vertical line running from your adam’s apple to your navel. When you position your feet on the approach make sure the middle of your body is consistently the same each time. Experiment to see what upper body rotation works best for you relative to your feet and your vertical line. Remember you are only working with about 1 degree of misalignment to miss the stake completely. Tip 14 — Is your back swing too long? Is it better to be accelerating or decelerating your forward swing? Remember the old adage, “if you don’t have to move it, don’t, if you do need to move it, make it as little as possible.” It is possible that you may be able to reduce misses if you only move your arm the necessary distance during the address, backswing and delivery. In most sporting events that involves throwing something, it is necessary to involve the momentum of the body. If you stand at the foul line and try to throw your horseshoe 27 or 37 feet, you will immediately feel your body wanting to add the effort necessary to get the horseshoe the required distance. The question is — how much effort do you actually need? During your next practice session try altering how much you raise the arm during the address position. Start by raising the horseshoe aligned to the front of the approach during the address and begin the backswing from that position. In this instance, it is helpful to start the downswing with a bend at the waist. Take your normal stride forward and see how far the horseshoe travels. Don’t give up too quickly, just add a little later release to get the horseshoe to the stake. Continue creeping your alignment point forward by 3-4″, until you find the alignment point that gives you a short ringer and consider that alignment point #1. Continue creeping forward with the alignment point until hitting midway up the stake and consider that point #3. The alignment point halfway between points #1 and #3 should be considered as your alignment point. That will give you a point that permits your arriving a little short and a little long as a happy medium and still gives you a choice for clearing propped shoes. An added bonus will be your discovery of a technique that requires less effort, more accuracy and softer landing.